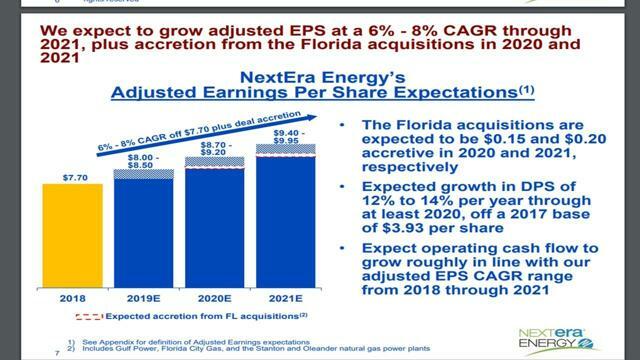 NextEra Energy is an exceptional utility stock. The company will continue growing its earnings and its dividend at a fast clip. NEE is markedly resilient during downturns. It thus offers great upside potential with minimum downside risk. The ongoing bull market has lasted more than a decade and has thus become the longest in history. As S&P is now trading just 2% off its all-time high, it is only natural to expect lackluster returns going forward, at least in the short term, with significant downside risk. However, investors should not sell their stocks and wait on the sidelines, as they will run the risk of missing the exceptional long-term returns of the stock market. NextEra Energy (NEE) is an ideal stock for the current phase of the stock market, as it is growing at a relentless pace and is remarkably resilient during recessions and bear markets. NextEra Energy operates in two segments, Florida Power & Light and NextEra Energy Resources. The former is a rate-regulated electric utility in Florida, the largest in the U.S. by retail MWh sales. It serves more than 5 million customer accounts in Florida and greatly benefits from the economic growth of the state and the favorable stance of the state, which favors meaningful rate hikes to support infrastructure growth. The other segment, NextEra Energy Resources, is the world leader in electricity generated from the wind and the sun. NextEra Energy is an exceptional utility stock. It compares favorably to the vast majority of utility stocks in almost every aspect. In general, utilities are slow-growth stocks, which need to spend hefty amounts to maintain and expand their networks and thus post markedly poor free cash flows. Due to this factor and the generous dividends they offer, they accumulate excessive amounts of debt. To provide a perspective, Southern Company (SO) and Dominion Energy (D) have posted negative free cash flows for 5 and 9 consecutive years, respectively, in the last decade. Moreover, Southern has net debt (as per Buffett, net debt = total liabilities – cash – receivables) of $86.6 B, which is about 40 times its annual earnings. NextEra Energy is a bright exception in the utility sector. It has posted positive free cash flows in 9 out of the last 10 years while it also has a healthy balance sheet. To be sure, it has an A- credit rating from S&P and Fitch and its net debt stands at $66.0 B. While this amount of debt is not negligible, it is only 10 times the annual earnings of the company and hence it is certainly manageable. In 2018, NextEra Energy grew its adjusted earnings per share by 15%, from $6.70 to $7.70. Since 2005, the company has managed to grow its adjusted earnings per share every single year, at an 8.5% average annual rate. This is an outstanding performance, particularly given that the above period includes the Great Recession. It is also remarkable that NextEra Energy delivered a total shareholder return of more than 14% in 2018, thus outperforming the S&P and the S&P Utilities Index by 19% and 10%, respectively. Despite its impressive growth record, NextEra Energy still has ample room for future growth. The company plans to install more solar panels than any other regulated utility. More precisely, it intends to install about 30 M solar panels in Florida, in an effort to reduce carbon emissions by 67% in the area. If this project materializes, it will render Florida a world leader in solar energy. Florida Power & Light has already secured solar sites throughout the state in order to execute its business plan. Thanks to this mega project and other growth projects, NextEra Energy will remain in its solid growth trajectory for several more years. The company will also benefit from its acquisition of Gulf Power, Florida City Gas and two natural gas power plants, which are expected to boost the earnings per share by $0.15 in 2020 and by $0.20 in 2021. Thanks to the promising growth projects, management expects the earnings per share to grow by 6-8% per year over the next three years, without including the benefit from the above acquisitions. Thanks to the impressive business performance of NextEra Energy, its stock price has essentially doubled in the last three and a half years. Consequently, the stock currently offers just a 2.7% dividend yield. While this yield is higher than the yield of the S&P (1.8%), it is much lower than the yield of many other utility stocks. However, income-oriented investors should not reject the stock for its lackluster dividend yield. Since 2005, NextEra Energy has grown its dividend at a 9% average annual rate. Moreover, its management has provided guidance for a 12-14% dividend hike next year, on top of the 13% dividend hike of this year. Furthermore, as the company has a healthy payout ratio of 60%, which is much lower than the payout ratio of most utilities, and a strong balance sheet, it is likely to keep raising its dividend at a fast clip for many more years. The high dividend growth rate will certainly compensate investors for the somewhat unattractive current dividend yield. To provide a perspective, if the company raises its dividend at a 9% average annual rate over the next five years, it will offer a 4.2% yield on cost in five years from now. It is also important to note that NextEra Energy has raised its dividend for 23 consecutive years. The company is thus poised to become a dividend aristocrat in less than two years. As Consolidated Edison (ED) is the only utility that belongs to the group of dividend aristocrats, the achievement of NextEra Energy will be admirable. Another potential achievement of NextEra Energy is the fact that it will probably become the first utility that reaches a market cap of $100 B. The stock currently has a market cap of $90 B. Thanks to its exciting growth prospects, it is likely to reach the milestone of $100 B the latest in two years. Like most utilities, NextEra Energy is resilient to recessions. Consumers do not reduce their electricity consumption even under the most adverse economic conditions. In the Great Recession, when most companies saw their earnings collapse, NextEra Energy saw its earnings per share fall just 1%. As a recession has not shown up for a whole decade, the resilience of NextEra Energy is a very important feature, which should not be underestimated by investors. The shareholders of NextEra Energy will continue to benefit from the strong growth trajectory of the company while they can also rest assured that the stock will remain resilient whenever the next bear market shows up. The defensive behavior of NextEra Energy was evident in the Christmas sell-off. While S&P plunged 16% in less than three weeks in December, NextEra Energy shed only 2% over the same period. Whenever the next bear market shows up, investors can rest assured that the stock will outperform the index by a wide margin once again. NextEra Energy offers a lower current dividend yield than most utilities but it is an exceptional utility stock. It has an impressive record of earnings and dividend growth while it still has ample room to keep growing for several years. Moreover, in contrast to most utilities, it has a low amount of debt and posts decent free cash flows. Furthermore, it is markedly resilient during recessions and bear markets. It thus offers a unique combination of features to its shareholders - high growth and resilience to downturns. This combination is paramount, given that the ongoing bull market has become the longest in history and thus S&P has limited upside potential, with significant downside risk.